Dream Homes Lifestyle presents: It’s Boomer! >Back To > Home > It’s Boomer! The Cutest Dog in La Jolla? 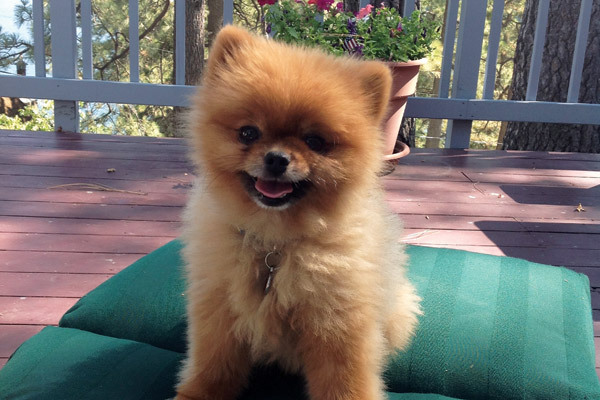 At five pounds and 2 years, this red Pomeranian is full grown. 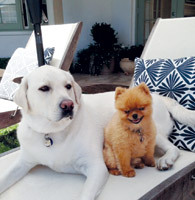 Boomer has been a family member of La Jolla resident Michelle Kearney for five months. Michelle’s households have always been home to several dogs and cats. In fact, now Michelle has two Pomeranians, Boomer and Benton, and a 3 year old yellow Labrador, Olivia (her coat is actually quite light for a lab). At night, Boomer can usually be found at the foot of Kendall’s bed. Olivia, the yellow lab, and Boomer are best friends snuggling and playing together. Celebrities and royalty in Europe actively bred the Pomeranians in the 1800’s. 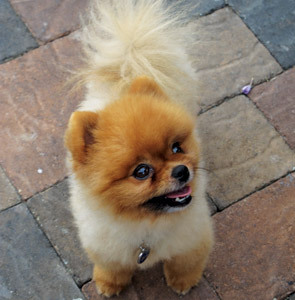 In Queen Victoria’s reign the size of the Pomeranians was reduced by 50%. La Jolla residents Michelle and Pat Kearney, and their family, adopted Boomer five months ago. Over the years Michelle has adopted labs, usually two at a time. Unfortunately Olivia, her 3 year old yellow lab, found herself alone after losing several of her friends. In addition, Michelle’s husband is allergic to cats so there were no cats either. When thinking about getting a companion for Olivia, Michelle’s 6 year old daughter, Kendall, made her wishes known. She wanted a dog like “Boo” the dog that was voted the world’s cutest dog. 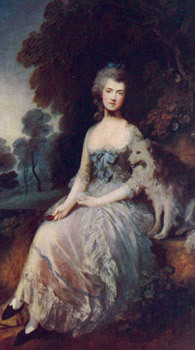 Michelle was unsure as she had always had a larger dog. Kendall had no doubts -- she wanted a look alike Boo. 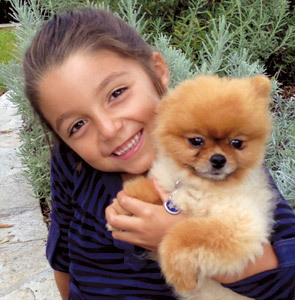 Kendall, Michelle’s six year old daughter, wanted a dog that looked like Boo, the internet sensation. 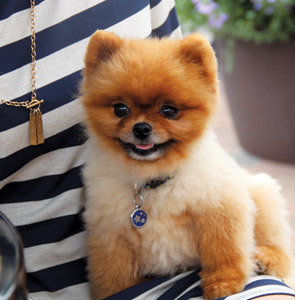 Pomeranians are among the most favorite breeds in the U.S. 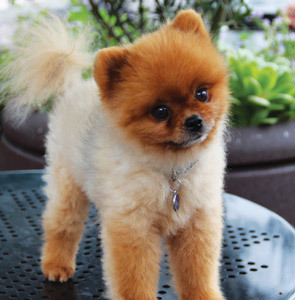 The Pomeranians are among the favorite breeds in the U.S., placing consistently in the top 20 of registered AKC dog breeds over the last 10 years. 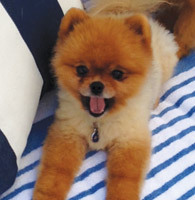 Nothing has done more to promote the breed than Boo, a Pomeranian that became an Internet sensation, is the subject of two photo books and was appointed a “spokes dog” for Virgin America airline. As of August 2013, Boo has over 7.3 million “Likes” on Facebook. 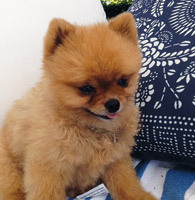 Not surprisingly Boo belongs to a Facebook executive who created a Facebook page. 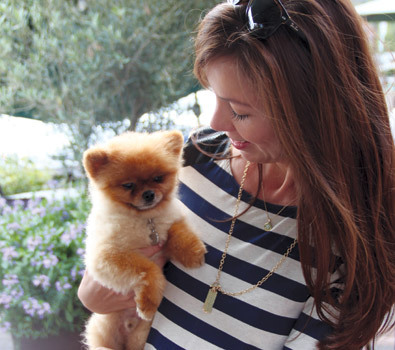 Michelle set out to find a Pomeranian for her daughter from a local breeder. However, shortly after picking up the dog, the breeder called and said a 2 year old dog had been given up and needed a home. She told Michelle that this dog had the shorter muzzle that Boo has which gives the dog an appearance of a cuddly, teddy bear. So of course Michelle said yes and told her husband that she was taking Boomer in as a foster dog. After a few days her husband asked where the potential owners were. Michelle had to admit that Boomer was home to stay! By that time, Kendall had bonded with Boomer so letting him go was out of the question. Michelle takes Boomer to Nickie at Uptown Woofs for haircuts and grooming. Boomer was added to their Facebook page and Boomer has more “likes” than any other dog on their page.